It’s a great rock and roll record: consistent, very strong songwriting, arrangements, performances, great sound, and adventurous or at least beautiful production that also stands the test of time. It has to work as a whole—larger than the sum of it’s songs. It has to be musically interesting enough to get you and keep you even if you couldn’t understand the lyrics. It is a great pop record. It’s accessible, catchy, melodic, and makes good use of harmonies. The lyrics occupy that evocative space between the boring extremes of story telling and completely cryptic. They are also not limited to pretentiousness or goofiness, and are at least occasionally poignant and/or profound. These criteria are a lot to ask from a record, of course, thus “Holy Grail.” When I presented them to my friend Zen, he said something like, “Wait a second, rock records don’t need to be dance records. Is it really better to try to do both?” Very sensible. In fact, that’s the point. It’s generally a bad idea to try to do too much with a rock record—you end up doing less. There are tradeoffs. This is why I chose “great” in criteria 1-3 instead of “perfect.” It was partly so that I could nominate an existing record—every perfect rock record so far miserably fails at least one of the other criteria—but also because I’ve come to think there are structural constraints at play. The consistent punchiness of a perfect dance record, for example, probably works against the dynamics and introspective moments of a perfect rock record. I call Guero a great rock and roll record. It’s not perfect, so it could be vulnerable to a new record coming along; it has its lazy moments, notably the intro to “Rental Car,” and to a lesser extent the verses of “Missing” and “Earthquake Weather.” Guero’s songwriting, performances, and sounds, however, are consistently great. The songs flow together. The production is top notch, adventurous, occasionally beautiful (notably in “Emergency Exit”), and has stood the test of nine years, which is pretty good. Not every song makes you want to dance, but most do, and insistently, so I call Guero a great dance record. It is undeniably accessible and catchy, with strong melodies and some harmonies—great pop record. 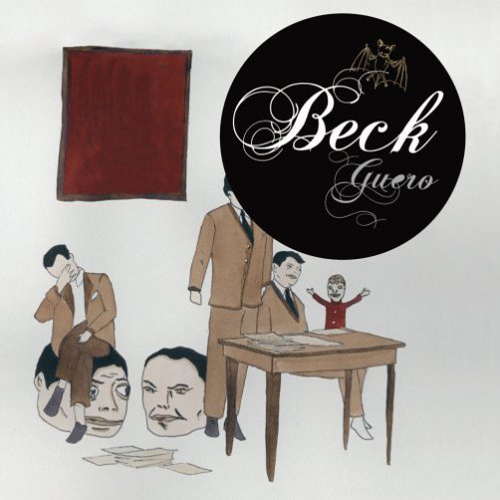 The lyrics are in the right space, somewhat cryptic but not boringly so, and not, as Beck’s lyrics so often are, over-the-top goofy. And the light-heartedness in the music and goofiness in the lyrics is balanced by real introspection and dark themes: deserts, dust, imagining death, and loneliness punctuated by peeking into others’ lives. Holy Grail of Rock Records?